The paper by coral reef researchers Bellwood, Hughes, & Hoey, Sleeping functional group drives coral-reef recovery in Current Biology (2006 16(24):2434 -9) shows that hidden ecological functions can be critical for ecological restoration and provides further evidence for the importance of hysteresis in ecological regime shifts. The researchers were examining the frequently observed shift of coral reefs from being dominated coral to macroalgae. This change is often due to the overharvesting of herbivorous fishes, particularly parrotfishes and surgeonfishes, that maintain the coral regime. They showed that a shift to the marcoalgae dominated regime on the Australian Great Barrier Reef was reversed not by parrotfishes or surgeonfishes, but rather by a species of batfish, Platax pinnatus, which is relatively rare on the Great Barrier Reef, and was thought to feed only on invertebrates. that research into ecosystem functioning should examine function in different ecological contexts. 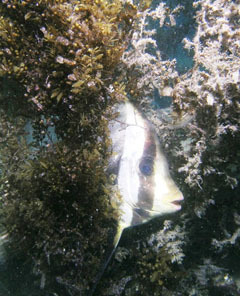 Interestingly, this research finding is similar to that of common property researchers who have discovered that many local resource management institutions contain “hidden” resources management practices, that are only activated during special environmental conditions – for example a fishery may have alternative property rights emerge during periods low fish abundance. Press coverage of this research can be found in a press release from James Cook University, the New Scientist, and the Washington Post.